What can I say Viv - your Granddaughter has exquisite taste in fabric like her Grandma.....lol. Well done Taylia - you did a beautiful job and well done Viv for showing her how to do it. 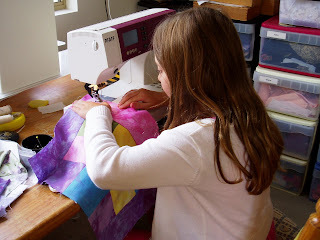 Wow, Taylia done a wonderful job - gives me confidence that my Tayla could use the sewing machine. The bag looks wonderful and the colour choice of fabrics delicious! Well done Taylia...you made a beautiful bag, you can be very proud of yourself, and grandma can too! You have made a beautiful bag Taylia and one day I would like to make one as nice as this. Your Grandma is a very good teacher. I bet your friends would all like this library bag.